Bed Sweet Buys: How Deep Does Your Fitted Sheet Pocket Need To Be? How Deep Does Your Fitted Sheet Pocket Need To Be? While the standard size mattresses have been 7 inches deep, in the last several years demand has led to the production of thicker mattresses, some even as thick as 24 inches. A mattress with a depth of more than the standard 7 inches can be referred to as a pillow top mattress and you will want a fitted sheet with a deep pocket. 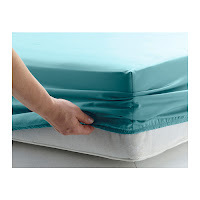 You can also purchase mattress pads that will increase the depth of the mattress. Thicker mattresses do not mean they are a higher quality mattresses as some would assume. High quality depends on what is on the inside. The linen industry has upgraded production to meet the demand of the deeper mattresses. But mattresses deeper than 20 inches may require custom made sheets. 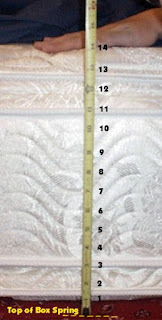 Before you shop for fitted sheets for your mattress, measure the actual depth overall of your mattress not just at the edge where the cord is. You will want to get down and look across the top of the mattress from the edge when you measure to get the accurate depth. Your fitted sheet should have a pocket of somewhere around 3 inches deeper, enough to fit under the mattress so that it doesn't work out during the nighttime. If the pocket on your fitted sheet is deeper than your mattress requires, it shouldn't be a problem. Fitted sheets with elastic around the entire sheet will pull in snugly even if the pocket is deeper than it needs to be.